This is the time of the year that seems the longest...especially with three children under 6 cooped up in the house. I have started running out of ideas of fun things to do around the house to keep them occupied, learning and having fun until that warm weather arrives! But one new thing I have started trying is having the children taking turns helping me with supper. This has really seemed to brighten their days but I have had to find smaller size kitchen utensils for them to use to help...otherwise, I have found, supper prep becomes a MESS!!! My children have been using Curious Chef kitchen tools and they LOVE THEM! Designed for kids 4+ with safety and smaller hands in mind, Curious Chef helps make the most out of time indoors with their line of real cooking tools for kids. Whether you enlist the kids to help make dinner or send them off on their own culinary adventure, Curious Chef has the perfect sized kitchen tools for them! My favorite set is the 27 Piece Foundation Set! It has it all and is the perfect starter kit for my budding chefs! This set provides everything the tools your kids need to cook up a storm on your day inside – from oven mitts to mixing tools. 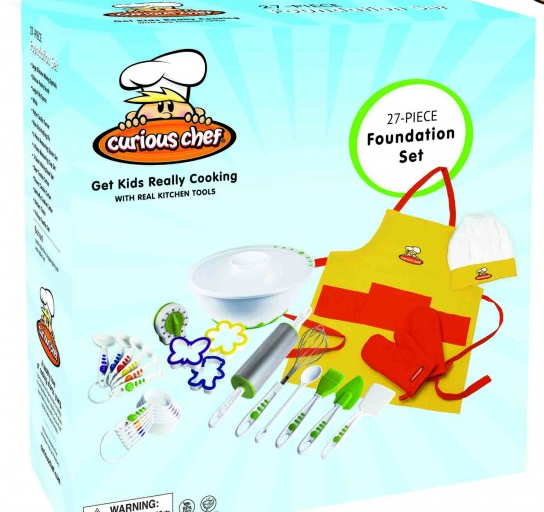 You can purchase the 27 pc Foundation Set for $59.99 from the Curious Chef website. Curious Chef is generously offering (1) 3 Piece Nylon Knife Set to a lucky winner!